Since reading James Fallows’ “The Tragedy of the American Military,” it’s been been hard to remember a time when we weren’t at war. With our government’s “chickenhawk” political approach to the military, it is essential to remember the people who fight, as opposed to those who make the decisions to fight. For many Millennials, we have been at war for most of our coming of-age period. The wars we know are ones fought in unfamiliar lands without clearly defined enemies and battlelines. This hasn’t always been the case, but regardless of the conflict or the nature or the enemy, one thing remains the same: the comradery between soldiers as they experience things overseas we at home could never imagine. This week for Pop Politics, I suggest three series that examine this comradery, each set during a different war. It is impossible to discuss the comradery of soldiers without talking about Band of Brothers. In this 10-part HBO miniseries, released in 2001, we follow Easy Company, a paratrooper unit during World War II. The name Band of Brothers is a reference to Shakespeare’s Henry V, where the king addresses his troops before the Battle of Agincourt, a battle in which they were outnumbered: “We few, we happy few, we band of brothers”. This theme is carried throughout the miniseries. You are introduced to the characters at basic training and follow them throughout the European Theater as they drop into Normandy, fail at Market Garden, and struggle in the cold, wintry Hurtgen forest. 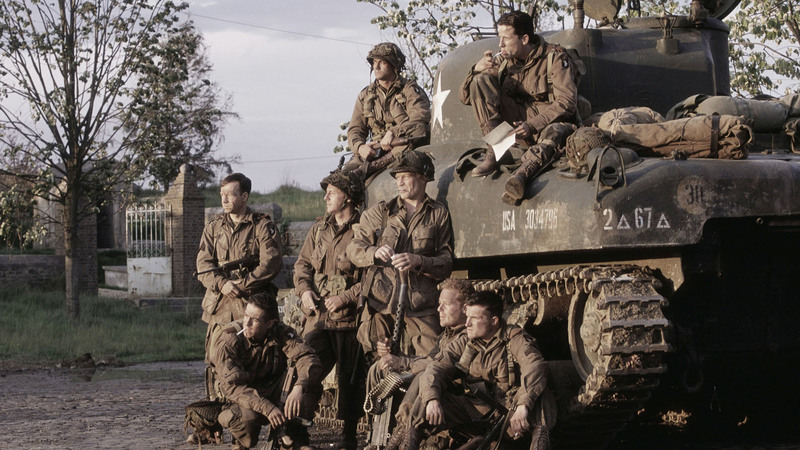 Following in the footsteps of Saving Private Ryan, Band of Brothers is about the friendships and struggles of Easy Company as well as the emotional impact of successes and failures have on each character. If you have time to watch only one episode, I would suggest “Bastogne,” in which Easy Company experiences the Battle of the Bulge while running dangerously low on supplies; the action specifically follows medic “Doc” Roe as he scrambles to find medical supplies to save members of his company. Did you know M*A*S*H is now available on Netflix? Well, starting February 1, all eleven seasons are now available for the first time on a streaming platform. If you have no idea what M*A*S*H* is, the series follows a team of army doctors and surgical nurses at a Mobile Army Surgical Hospital (MASH) in Uijeongbu, South Korea during the Korean War. The television series is as much an allegory about the Vietnam War as it is about the Korean War, since it was written during the Vietnam era. The series is often considered a dark comedy for its dramatic subject matter, as episodes often go from comedic to somber quite often. This is what sets M*A*S*H apart from other comedic military-themed series of a decade earlier, like McHale’s Navy and No More Time for Sergeants. The series often dealt with the intersection of patriotism and obligation between the civilian draftees and the career Army regulars. If you have time for only one episode, make sure you see the season three finale “Abyssinia, Henry”, considered one of the greatest television episodes ever made, following the honorable discharge of 4077 MASH’s commanding officer, Lieutenant Colonel Henry Blake. Unlike the first two series, Generation Kill is about a war with which many Millennials have a personal connection. We know about the Iraq War because we lived it for a decade, have had friends and family leave home to fight, and have studied the political aftermath. The effects of the Iraq War are still pending in our lives right now. Generation Kill is the Band of Brothers for our generation. An HBO documentary released in 2008 and created by The Wire’s David Simon (who also wrote all seven episodes), Generation Kill follows a Marine corp battalion during the 2003 invasion of Iraq. After its release, several critics praised the miniseries for its avoidance of typical Iraq War cliches. Writer David Simon’s nuanced storytelling is about the soldiers fighting in Iraq and not the politics argued on home soil. Generation Kill reminds us that our friends, family, and neighbors fighting in Iraq and Afghanistan are just like us (they also think Jennifer Lopez is hot), they just have a more dangerous backyard. Don’t just watch one episode of this series, watch it straight through from start-to-finish. ← Pop Politics: What should you watch?